As we reflect back on arguably a successful season for Louis Van Gaal’s Manchester United, there are lot of areas that need to be improved upon if they are to become world beaters again. One such area that needs attention is the ‘Number Nine’ position, an out-and-out striker who is capable of scoring 30+ goals, season after season. 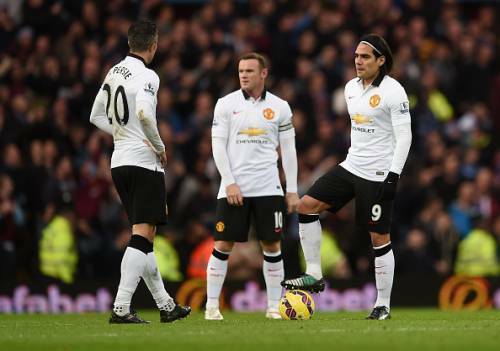 On paper, United had the luxury of having three such players – Wayne Rooney, Robin Van Persie and Radamel Falcao, who could potentially score more than 25-30 goals. But it wasn’t to be. They could only manage a combined tally of 28 goals, 4 less than that of Sergio Aguero for Manchester City and 3 less than Harry Kane’s tally for Tottenham Hotspur. Sir Alex Ferguson in the summer of 2012 vowed to never lose a title on goal difference and signed Van Persie from Arsenal for a fee of £24 million, and handed him jersey number 20 hoping he’d help to win the 20th league title for Manchester United. Van Persie delivered the goods immediately and there it was the 20th title, in Ferguson’s hands. What has often seperated the champions from the rest is the presence of a goalscorer, someone who can consitently find the back of the net. Someone who can run behind the defenders, penetrate the most stubborn defences and get that vital winning goal for the team. Someone who can consistently surpass the 20 goal mark every season. There are a few strikers in football today who can achieve that feat, the likes of Zlatan Ibrahimovic, Diego Costa, Sergio Aguero, Luis Suarez and the list goes on. The situation at Manchester United is peculiar. Wayne Rooney has crossed the 20 goal barrier only once in the past 5 seasons, and only four times in his career. He is someone who likes to drop deep, collect the ball and play it around. He is more of a creative outlet than a poacher. He played in a variety of positions last season under Van Gaal, including a midfielder. He played as a striker in a 5-3-2 system, as a lone striker in a 4-3-3 and 4-2-3-1, and as a number 10 in 4-2-3-1 system. He was also deployed as a midfielder in these formations. What works, arguably, the best for him is Rooney playing as a number 10, with a strike partner. Then there is the case of Robing Van Persie, Robin Oh Robin! He admitted a month back that it was indeed a strange situation for him to be warming the bench. A lot was expected from him following the arrival of his compatriot, Van Gaal. It was a mouth watering proposition for the United fans, the duo working together after a good World Cup. But things have turned out quite differently and he has no one else to blame as his performances have hardly helped his case. A return of 10 goals in 29 games for a striker of his stature is simply not good enough. He was injury-plaugued throughout and gradually fell down the pecking order. From being a potential candidate for captaincy last summer to, umm well, this. He hasn’t been anywhere close to his best ever since scoring 30 goals in his very first season. The arrival of Radamel Falcao last summer had sent a real sense of enthusiasm through the Old Trafford faithful. But what followed was simply unbelievable, 4 goals in 29 games. He can argue that he was rarely given a run of games to prove himself, but from what we did see of him in the course of the season, he looked nowhere close to being the Falcao that terrified defences. He has bee allowed to leave Old Trafford following his dismal loan spell, so he is not really in the picture anymore. One striker who is returning to United is Javier Hernandez, who had left the club on a loan hoping to get more game time, which he did only towards the end of the season. He did indeed have a good end to the season by scoring some vital goals for Real Madrid. The Mexican, also known as ‘Chicharito’, meaning ‘little pea’, is an intuitive goal scorer. He is a poacher and has a knack of being at the right place at the right time, as he proved so often during his time at United. His direct style compliments that of Rooney, and the two together could make a deadly strike duo. Its not all that dark and gloomy for Manchester United though. They do have one James Wilson coming through their ranks, who reminds some of Michael Owen in his prime. Wilson burst through the scene by scoring two goals on his first team debut againt Hull City and has then gone on to make a handful of cameo appearences. He has impressed and the potential is definitely there. But at the age of 19 with so little experience, it will be good to let him go out on loan and get some experience under his belt. The ‘Ninth Conundrum’, or the dilemma that Louis Van Gaal faces this summer is the decision over the number 9 position. Van Persie turns 32 this august, Rooney is not scoring as much as he should be, Falcao may join Chelsea, Chicharito is back at Old Trafford and James Wilson is still very inexperienced. And there are rumours of United interested in securing the services of Gonzalo Higuain and Harry Kane. It is not so surprising afterall to see a high-profile striker linked to United at the moment. Van Gaal always has the option of keeping faith in the current crop of players, given they have secured the signing of winger Memphis Depay who topped the goalscoring charts in the Dutch league. Last season also saw United’s midfield stepping up and shouldering responsibility for scoring goals with Ander Hererra getting 6 of his own in the league, Fellaini also scoring 6 and Juan Mata chipping in with 9. But at a time when United are really looking to push on from here, they should be looking to mount a challenge for the title next season. They cannot go into the season with an uncertainty about the number nine position. It will indeed be interesting to see if Van Gaal can get the best out of Van Persie in the coming season. We can definitely not rule out a comeback, especially after the manner of re-emergence of Ashley Young and Marouane Fellaini last season. Van Gaal deserves a lot of credit for bringing out the best in two players whose time had seemingly run out. I’m sure it is a conundrum that someone like Louis Van Gaal would relish.